To join the conversation, use the scroll bar to complete the community survey in the box below or click here. For more than 60 years, the Foothill-De Anza Community College District has demonstrated excellence and innovation in academic programs and student services. As one of the largest community college districts in the United States, Foothill-De Anza serves about 63,000 students a year as a recognized California educational leader. In this fast-moving environment, the district must continue to maintain learning environments that address the educational and career goals of our diverse local student body. The cost to attend California’s public universities is at least four times that of attending a local community college like Foothill or De Anza. As a result, many local students and their families rely on our colleges to save tens of thousands of dollars. The district is committed to increasing opportunities for local students to transfer to four-year universities, earn college credits, certifications and job skills at a reasonable price. As we work to ensure district classrooms and labs continue to keep pace with current technological, teaching and learning needs, the district wants to engage residents from every community we serve. The district welcomes your participation in this conversation. Please take a few moments to make us aware of your priorities and perspectives by completing the online community survey. With your help, the district can continue to provide the excellent, accessible local college education we all take pride in. 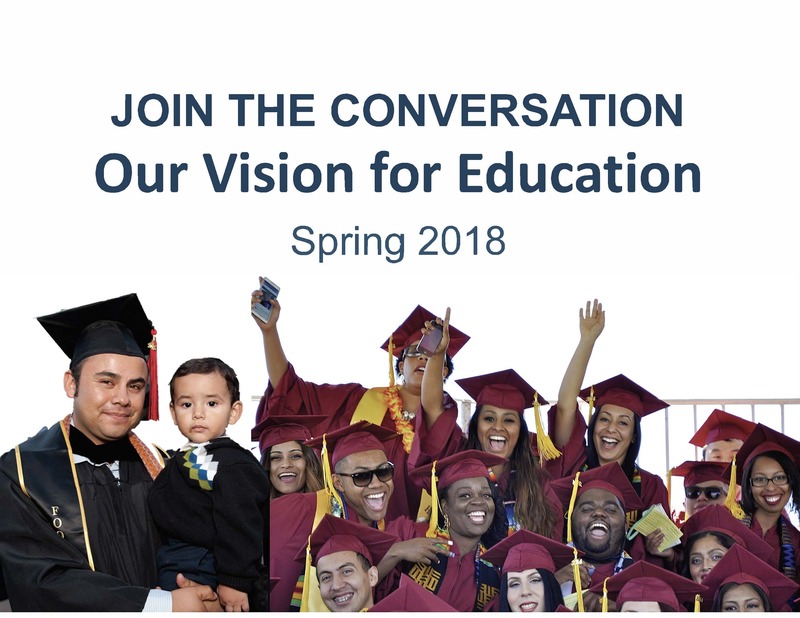 Learn about Foothill-De Anza's vision for education (PDF). Q: What is the district’s mission? A: The Foothill-De Anza Community College District provides excellence and innovation for about 63,000 students a year and is a recognized educational leader in California and the nation. The cost to attend California’s public universities is at least four times that of attending a local community college like Foothill or De Anza. As a result, more local students and their families rely on our colleges to save tens of thousands of dollars. The district must continue to increase opportunities for local students to transfer to four-year universities and earn college credits, certifications and job skills at a reasonable price. Q: How are Foothill and De Anza colleges preparing students for university transfer or jobs? A: Our colleges are top performers and provide an excellent, well-rounded education. The district’s outstanding job training and workforce preparation programs serve students of all ages and backgrounds, including veterans. To maintain this momentum, we must continue to provide the science, technology, arts and vocational opportunities and upgraded learning environments that prepare students for four-year universities and today’s high-demand jobs and careers. Q: What are the district’s upcoming educational needs and priorities? A: The district has launched a Join the Conversation outreach effort to engage the public around these needs. Please share your perspectives by visiting www.fhda.edu/JoinTheConversation and complete a community survey online today. We also are visiting community organizations to solicit feedback. If you belong to an organization the district can present to, please contact Chancellor Judy Miner at chancellor@fhda.edu.